If the vehicle battery is dead or there is a malfunction in the electrical system and the liftgate can not be opened, perform the following procedure as an emergency measure to Open it: 1. Remove the cap on the interior surface of the liftgate with a flathead screwdriver. 2. 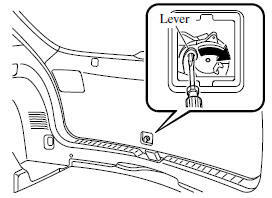 Turn the lever to the right to unlock the liftgate. After performing this emergency measure, have the vehicle inspected at an Authorized Mazda Dealer as soon as possible.